LOCATION: James Bridges Theater, UCLA. For the past four years, UCLA and USC have co-hosted the public symposium Transmedia, Hollywood, which explores the role of transmedia franchises in today’s entertainment industries. Led by Denise Mann (UCLA) and Henry Jenkins (USC), Transmedia, Hollywood has turned the spotlight on media creators, producers and executives, engaging them in critical dialogue with top researchers across a wide spectrum of film, media and cultural studies to provide an interdisciplinary summit. This year’s Transmedia, Hollywood conference is taking on a new challenge—tracking the major changes taking place in the television industry. It is now called Transforming Hollywood. Join 5D Institute founder Henry Jenkins, Denise Mann and their guests on April 4th for this one-day symposium, to examine the landmark transformations that are impacting creators, distributors and audiences in extraordinary ways. 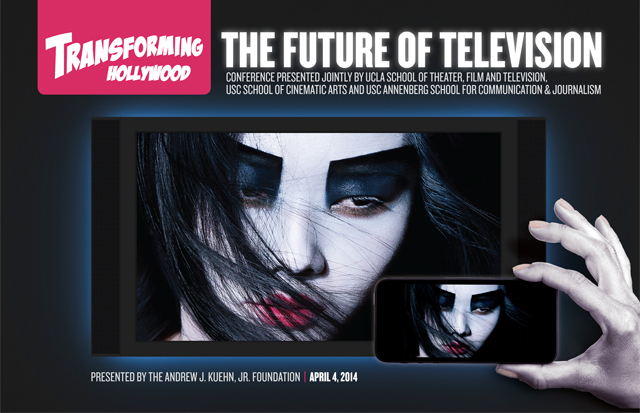 On April 3, the eve of Transforming Hollywood 5: The Future of Entertainment, an exciting event will take place across town at USC, home of TH5 co-director Henry Jenkins. This event will showcase the outstanding work being done right now by female writers, producers, and show-runners working at all levels in the television industry -- from producers of prime time network and cable series to creators of series which are now being distributed directly through digital platforms. “...We want to bring more recognition to this generation of highly creative women who have broken through historic glass ceilings and have started to reshape the kinds of stories television tells. Our hope is to bring a critical mass of them together for one event, where they can share their stories and discuss their creative visions for the future of television...".